NHM Punjab Notification is out. NHM Punjab is recruiting for 137 Senior Treatment Supervisor And TB Health Visitor Govt Job Posts. 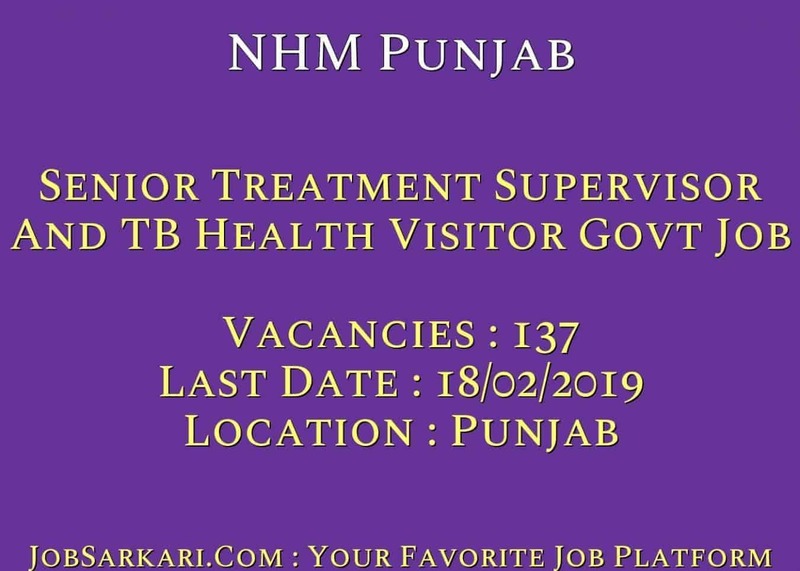 You can check NHM Punjab - National Health Misison last date, download NHM Punjab notification, visit NHM Punjab official website and check other NHM Punjab Vacancy details.Complete Vacancy and recruitment Details about 137 Senior Treatment Supervisor And TB Health Visitor Govt Job vacancies in NHM Punjab are provided below by JobSarkari.Com only for you. Backward Classes, Punjab 11 04 15. BC-Ex Servicemen/LDESM Punjab 02 02 04. Ex Servicemen/LDESM, Punjab 10 08 18. Freedom Fighters Punjab 01 01 02. Scheduled Castes others, Punjab 14 09 23. Balmiki/Mazbhi Sikhs Punjab 10 00 10. SC(M&B) Ex Servicemen/LDESM Punjab 03 02 05. SC(R&O) Ex Servicemen/LDESM Punjab 02 02 04. Scheduled Castes -Sports Persons, Punjab 01 01 02. Sports Persons, Punjab 03 02 05. Total No. of Post 88. 49. 137. Senior Treatment Supervisor Candidate Must Have Passed Bachelor’s Degree And Having Certificate Course in Computer Operations (Minimum 6 Months) and Must Have Permanent two Wheeler Driving License & should be able to drive two Wheeler and At least one year of work Experience Under RNTCP /Govt Institutions and Punjabi pass upto Matric Standard. Mini 18 Years and Max 37 Years. TB Health Visitor Candidate Must Have Passed Class 12th or Equivalent and Should Have Possess a Diploma in Multipurpose Health Worker and Must be Registered as Multipurpose Health Worker with the Punjab Nurses Registration Council. and Certificate Course in Computer Operation (Minimum 6 Months) and Punjabi pass upto Matric Standard. Mini 18 Years and Max 37 Years. 6. Online Applications Can Be Submitted On or Before 18th February 2019. Q. What is the Last Date For NHM Punjab Senior Treatment Supervisor And TB Health Visitor Govt Job Vacancy ? A. 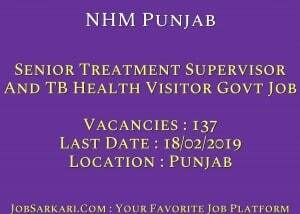 Last Date for NHM Punjab Senior Treatment Supervisor And TB Health Visitor Govt Job Posts is 18/02/2019. Q. What is the Form Type of NHM Punjab Senior Treatment Supervisor And TB Health Visitor Govt Job Recruitment ? A. The Form Type for NHM Punjab Senior Treatment Supervisor And TB Health Visitor Govt Job Posts is Online. Q. How many vacancies are available in National Health Misison Senior Treatment Supervisor And TB Health Visitor Govt Job Posts ? A. There are about 137 Vacancies in National Health Misison Senior Treatment Supervisor And TB Health Visitor Govt Job Posts. Q. What is the Full Form of NHM Punjab ? A. Full Form of NHM Punjab is National Health Misison .